IN-FLOOR HEATING SYSTEMS – Senergy Mechanical Inc.
Use our form to estimate the initial cost of the project. As an alternative to regular home heating using furnaces and circulating hot air throughout the house, there is in floor heating. Without using hot air, this method uses hot water instead. The hot water runs underneath or in the floor through a series of pipes that cover the entire area of the room. The heat from the water warms the floor and what it comes in contact with, like humans. The pipes are unseen beneath the floor and run quietly making them unnoticeable. If you have been annoyed before by the hum of the furnace or air ducts then this would be the ideal heating method for you! HEATING THE ROOM THE RIGHT WAY! Another good quality of in floor heating is the even heat distribution. With furnace heat, the temperature often times is uneven throughout the room. It is hotter closer to the air duct, the hot air rises leaving the floor drafty if there is an open window or door and to get thoroughly warm you have to turn the heat up at which point it can get stuffy. With in-floor heating you will not have that problem! The system focuses on warming you from the bottom which is ideal for human body temperature. Your feet and body will remain warm while your head will remain comfortably cool. For this reason sleeping in a room with in-floor heating is very comfortable. You will be warm in your bed and the air will not be too hot to fall asleep in. In rooms with high ceilings in-floor heating is the most economical option. With regular furnace heating you would need more hot air to heat up the entire room, while with in-floor heating the lower half of the room remains warm while you don’t waste energy on heating the unoccupied top half. This is not the only way in-floor heating helps save you money. By having the option to set different rooms to different heat settings you don’t waste energy heating the whole house to the desired temperature of one room. Rooms that have high traffic like the kitchen, family room and bedrooms can be given the appropriate amount of heat while less used rooms like the dining room or den can be set to a lower heat setting to save energy. 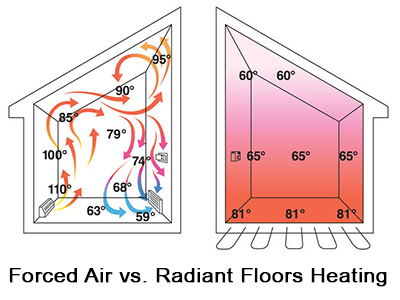 Compared to circulating hot air throughout the house, in-floor heating is also cleaner. Dust, dirt, even pet hair is blown throughout the house while it is being heated by a furnace. In-floor heating does not stir any air as it simply radiates warmth. In light of this, in-floor heating is the perfect solution for people with allergies. By using top quality materials in our work, we ensure that you will get the best, long-lasting results. Standing at the forefront of technology Senergy Mechanical Inc. provides the most economical and eco-friendly solution to heating. If you are interested in in-floor heating do not hesitate to call us today for more information. We can be reached at (647) 298-9247. At Senergy Mechanical Inc. we employ the best professionals on the market to ensure you get the most out your experience with us. As a company that is completely dedicated to customer satisfaction we pride ourselves on the level of quality that we provide.